Film screening and panel discussion: "1948: Creation and Catastrophe"
Join filmmaker Andy Trimlett and Colgate faculty to watch and discuss the new documentary "1948: Creation & Catastrophe." 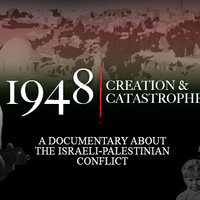 Through riveting and moving personal recollections of both Palestinians and Israelis, "1948: Creation & Catastrophe" reveals the shocking events of the pivotal year in one the most controversial conflict in the world. It tells the story of the establishment of Israel as seen through the eyes of the people who lived it. It is simply not possible to make sense of what is happening in the Israeli-Palestinian conflict today without an understanding of 1948. This documentary was the last chance for many of its Israeli and Palestinian characters to narrate their first-hand accounts of the creation of a state and the expulsion of a nation. The documentary includes interviews with veterans, refugees, survivors and historians of the war collected in Palestine, Israel, Jordan, Lebanon, the United Kingdom, Canada and the United States. Those who lived through the war are the centerpiece of the story, but respected historians, including Charles D. Smith, Avi Shlaim, Nur Masalha, Benny Morris, Ilan Pappe, Rashid Khalidi and Sharif Kanaaneh provide context for the events.